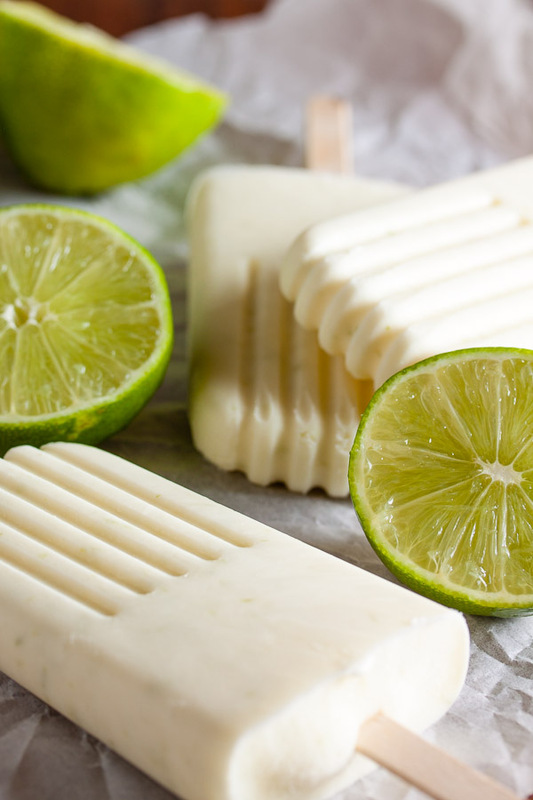 Key Lime Pie Popsicles | wanna come with? Again with the lime. I did finally use up all the limes I had the other week, but then I was enjoying them so much that I bought some more. And good thing, too, because it gave me the opportunity to try this recipe. I’ve got several popsicle recipes pinned that I want to try, but when I saw this one on Smitten Kitchen, I knew I had to have it. Now. 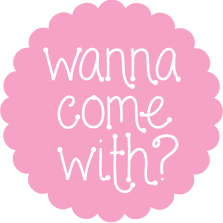 For one thing? Lime. For another? Smitten Kitchen. ‘Nuff said. If you haven’t guessed, I’m adding popsicles to my weekly treats for the office for the summer. I’m going to keep making cookies (no-bakes for now), but all the beautiful fruit at the farmer’s market has been inspiring me. Not to mention the fact that the air conditioner has broken down in our section of the office (yay!) and it gets really hot towards the end of the day. Popsicles will be appreciated. 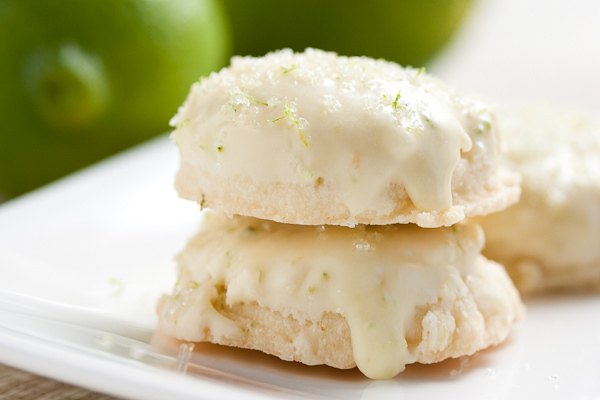 I totally cheated and used regular limes for this recipe. It’s what I had on-hand, and while it’s not a true “key lime pie” flavour, it’s certainly good. When are key limes in season, anyway? And it looks like Deb used regular limes in hers as well so I don’t feel too bad. Just FYI, I brought a batch of both these and the cucumber lime mint pops to work last week and they were devoured within less than three hours. People were having them for breakfast! And a couple days later I brought in a couple different types of popsicles (strawberry and blueberry-lemon), and while they were enjoyed, people kept asking when I’d be bringing more of the lime ones in. 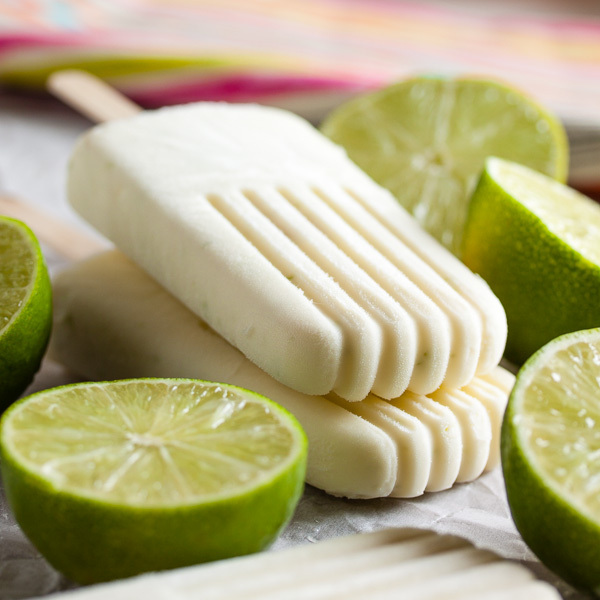 As a result, in addition to making a variety of popsicles with whatever fruit is at its peak during the summer, I’ll also continue to make the lime popsicles, since they’re so popular. And with good reason. This is a seriously good popsicle! 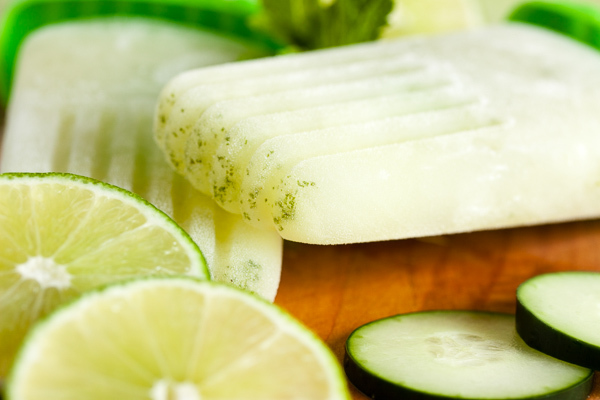 The cucumber lime mint one is light and refreshing, and this one is rich and creamy and dessert-like, but still has that fresh lime flavour. If you asked me to name my favourite? I wouldn’t be able to choose. These are both really good! The original recipe included a step to coat the finished popsicles in finely crushed graham crackers. 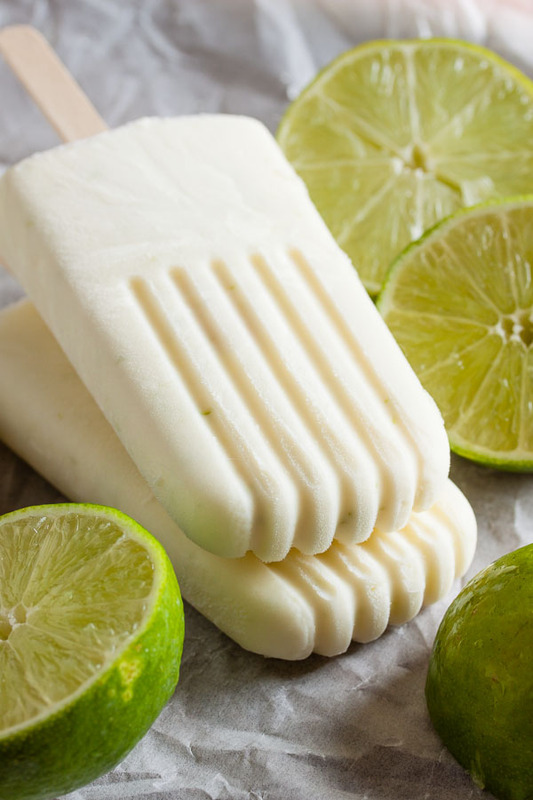 I’ve had a key lime popsicle coated in crumbs before, though, and for me they kept falling off and making a mess, and the ones I did eat were kind’ve soggy and unappealing. So I decided to skip that step. 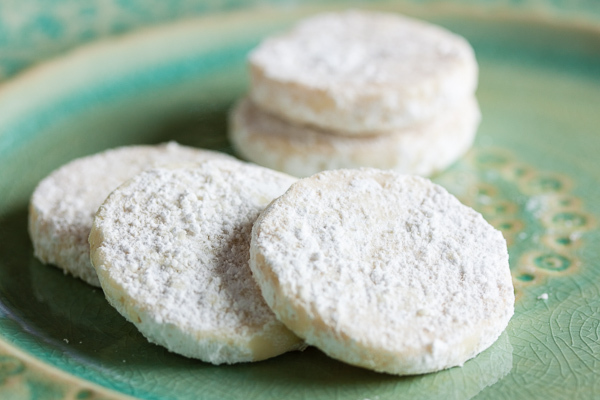 Adapted from Paletas by Fany Gerson, although I originally saw the recipe on Smitten Kitchen. Will make 6 three-ounce popsicles (depending on your mould). Combine all ingredients together in a mixing bowl, preferably one with a pour spout. A large measuring cup will also work well. Stir or whisk well until the mixture is smooth. 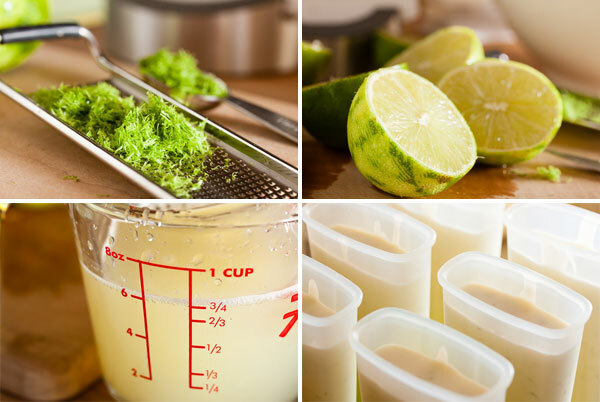 Pour the mixture into your popsicle moulds, and freeze for about 5 hours. 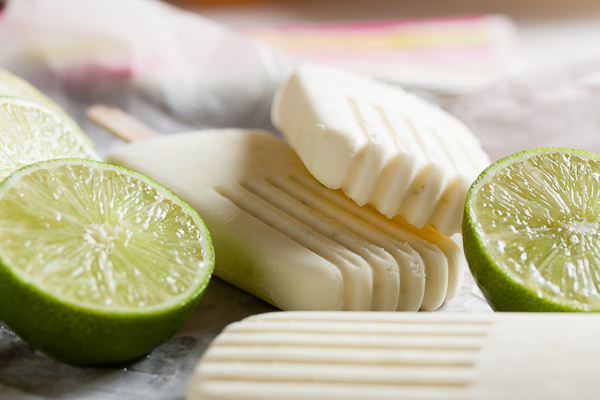 i am so craving one of these popsicles right now.. anything key lime related i am a massive fan of. definitely perfect for summer! Just made these today and they’re SO yummy! I steeped a few sprigs of mint with the lime juice and it turned out great! That sounds like a great twist on this recipe! Lime and mint? Yum.